Our program focuses on the land grant mission of Cornell University. We strive to work directly with regional agriculturalists to solve insect pest related issues. We employ effective, economically viable, integrated and cross disciplinary approaches (horticultural and pathologically sound) for conventional and organic production systems. Key areas of study focus heavily on tree fruit, with emphasis on commercial production practices. 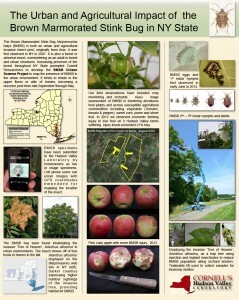 Screening trials to better understand optimum placement and timing of insect pest management tools are conducted at the Hudson Valley Research Farm in apple and pear experimental orchard blocks. Trials specific to problem insects are also conducted on grower sites as both an educational venue for problem solving and as a research extension site for workshops to convey production practices. Laboratory bioassay studies are also conducted at the station facilities where rearing of various insect pest species can be observed under controlled environments during experiments. Invasive species studies that include both lab and field trials have become an important part of our focus. Organic studies in pome fruit production are on-going. These include biological control applications employing sustainable nematode species applied to the orchard floor to reduce endemic populations of plum curculio (PC) management; use of treated exclusion netting to reduce migrating PC, microbial control using granulovirus virus specific for codling moth management and the incorporation of duel OFM and CM mating disruption for the lepidopteran complex being tested and use of barrier film in place of insecticides for managing the seasonal insect pest complex. Organic brown marmorated stink bug testing is also ongoing with field and laboratory testing on field and laboratory reared colonies. We maintain partnerships with the NYS urban and suburban community through a statewide citizen science project on BMSB population movement through NY state.